I am having trouble getting some specific table's with HTML Agility Pack. I cannot change the actual HTML either, so I can't use other ID"s or Classes or anything. Can someone show me how I would access each individual table of the following? I would go through everything. I want to be able to access tables differently to correlate where I am storing the data. 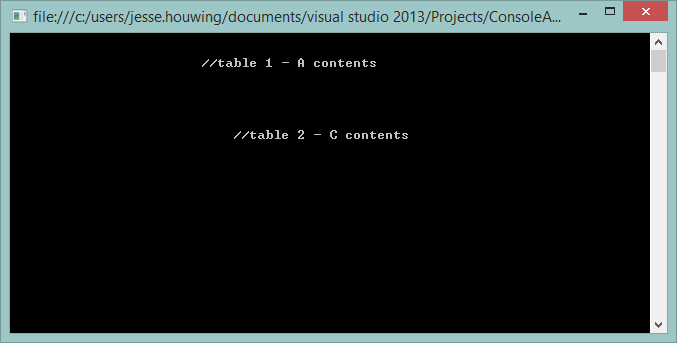 but using an index does not seem to work, when I try to specify a table with it, it still reads in all tables or none. Same thing applies to this, it either does not work at all or gets everything. My attempt to get ONLY Table 1 - A's contents. Both give null or endcodingfound exceptions. Not sure what else is going on, but by extending your test table to this code, the following just works on my test. It might mean that you need to share a little more context.